Hello friends! 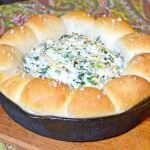 I’m sharing this delicious warm turnip dip with a bread ring that I cook in a skillet. 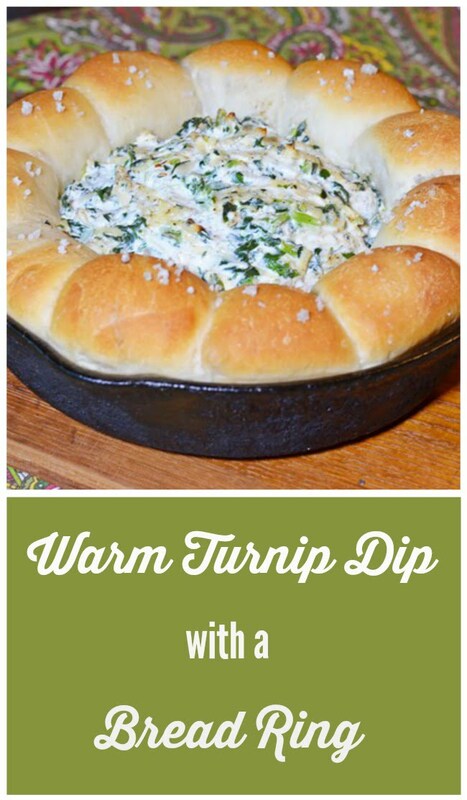 If you make it, people will be so surprised to find out that there are turnip greens in the dip. I know I was the first time I ate this. My friend Angie has made and served this dip at our annual golf benefit party for several years so I finally asked her for the recipe. Someone had passed it along to her but I have since found out that it’s an old Southern Living recipe. Except Angie and Southern Living did NOT cook it in a skillet nor did they put a bread ring around it! 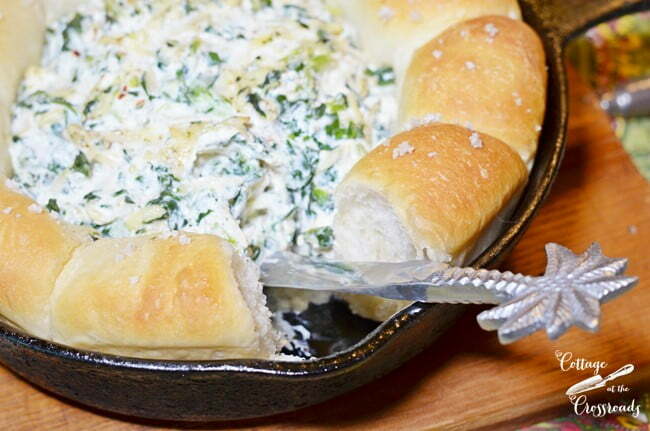 The creamy dip tastes similar to a spinach and artichoke dip but better, in my opinion. So if you like that dip, then you are going to LOVE this! It’s perfect party food because it looks so pretty with the ring of bread, but the combo of the tasty dip on the warm bread is a match made in heaven! I’m sharing this recipe as part of a Favorite Party Recipes Blog Hop hosted by the lovely Kathy of Petticoat Junktion. You will find 9 more appetizer recipes today, and tomorrow there will be 10 awesome dessert recipes. So if you have an upcoming party or gathering, we’ve got you covered! Now, back to this recipe! 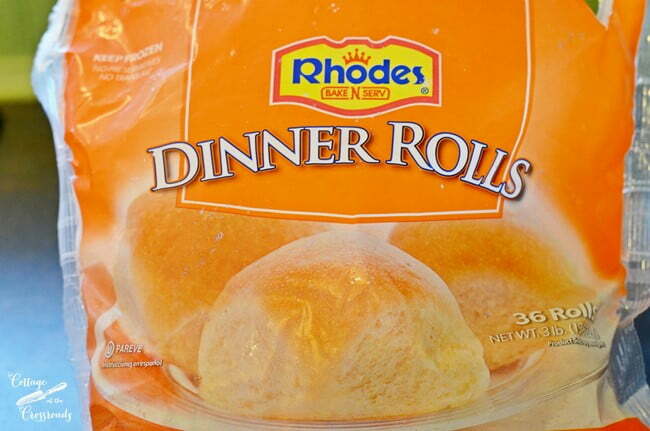 To make the bread ring, you will need a package of Rhodes frozen dinner rolls. I can only find these at my local Walmart, and be sure to get the ones in the orange package. You won’t use all the frozen rolls for this recipe. I take out what I need and then put a rubber band around the opening and stick the package back in the freezer. Pour 1 tablespoon of olive oil in a cast iron skillet and use your fingers to coat the bottom of the skillet as well as the sides. 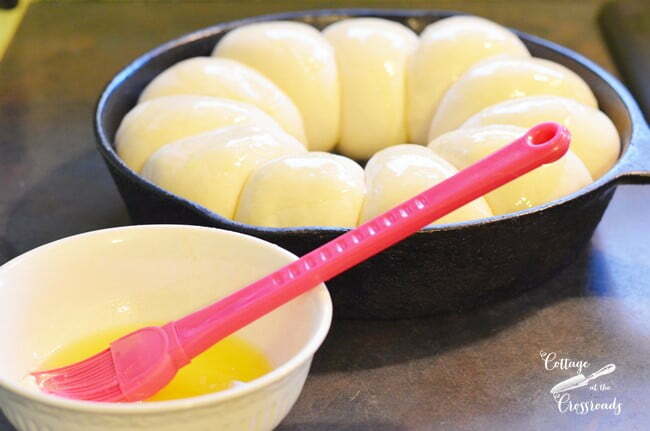 I can fit 11 frozen balls of bread dough in my 9 inch skillet. Leave about 1/4 inch of space between each ball of dough. Place a tea towel over the top of the skillet and allow about 3 hours for the dough to thaw and rise. This is what they look like after they have thawed and risen. So pretty and puffy! Preheat the oven to 350 degrees, melt 2 tablespoons butter, and brush the tops of the risen rolls with the butter. In the meantime, mix up the turnip dip mixture according to the directions below and spoon it into the center of the ring of rolls. If you are not able to get all the mixture into the center of the ring of rolls, just put the extra in a small baking dish. As soon as you pull this out of the oven, everyone will congregate around it, I guarantee it! If you run out of rolls to serve with the dip, just use some crackers, flat bread, pita chips, or Fritos. It’s good with all of those! You’ll find all the details on how to make this delicious dip below. 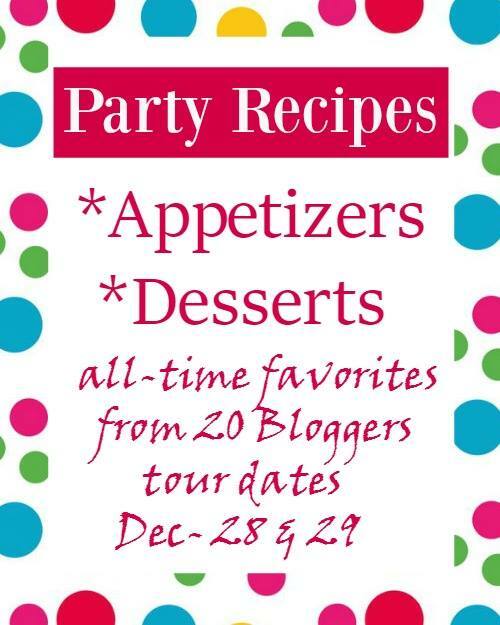 And don’t forget to visit all the links below to find more awesome party food recipes! Spread 1 tablespoon on the bottom and sides of a 9 inch cast iron skillet. 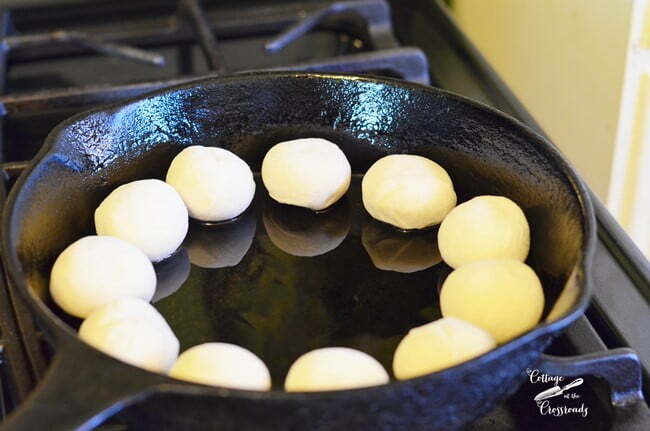 Place 11 frozen dinner rolls 1/4 inch apart in the skillet. Cover with a tea towel and allow the rolls to thaw and rise for about 3 hours. Melt 2 tablespoons butter and brush over rolls. 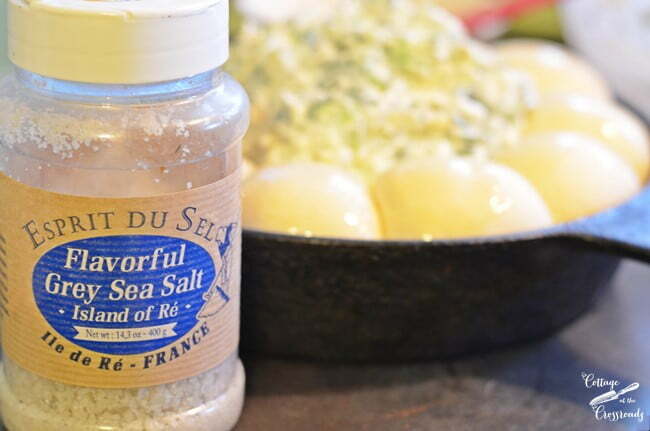 Sprinkle 1-2 tablespoons sea salt on the rolls. Cook bacon in a Dutch oven over medium high heat 5-6 minutes or until crisp. 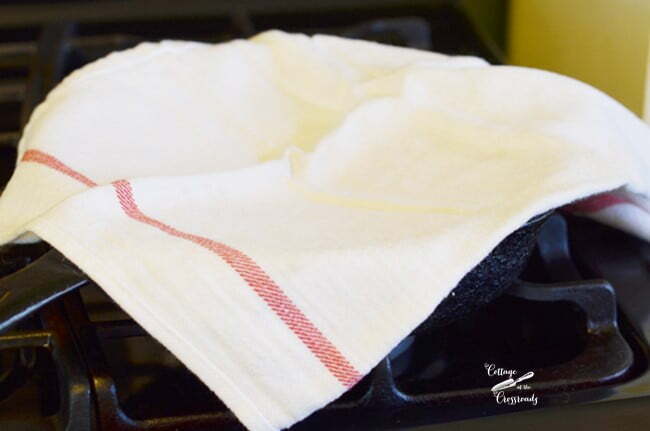 Remove bacon and drain on a paper towel. Saute onion and garlic in 1 tablespoon of hot bacon drippings in the Dutch oven. Add wine and cook 1-2 minutes, stirring to loosen particles from bottom of Dutch oven. Stir in turnip greens, next 4 ingredients, and 1/2 cup Parmesan cheese. Cook, stirring often, 6-8 minutes or until cream cheese is melted and mixture is thoroughly heated. 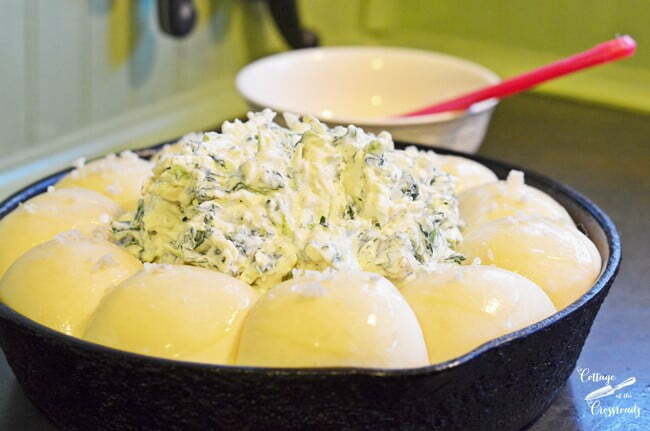 Pour the turnip mixture into the middle of the rolls in the skillet. Bake at 350 degrees about 15 minutes, remove and add the bacon pieces and remaining 1/4 cup of Parmesan cheese on top of the dip. Cook for an additional 5-10 minutes or until the rolls are golden brown. If your rolls have risen a lot, there may not be room for all the turnip mixture to fit in the middle of the rolls. Just add the extra to a small baking dish. When the rolls run out, serve the dip with flat bread, pita chips, Fritos, or crackers. How fun! Now I’m going to have to track down one of those skillets…. This is a great recipe and I love how you use one pan. Awesome and great for tomorrow. This looks so good–I’m sure it will kill me 😉 Pinning! We were just king about how much we love cooking in an iron skillet! This is an awesome idea, totally trying ASAP! I am not very familiar with turnips, but this sounds awfully tasty! Wow Jane! The recipe does look good and different too. BUT I simply looooove the idea of serving it in a cast iron skillet with bread rolls. Best recipe idea I’ve seen in a while!! Hi Jane, I’m made this yummy SL recipe for New Years Day to get our serving of greens for good luck! 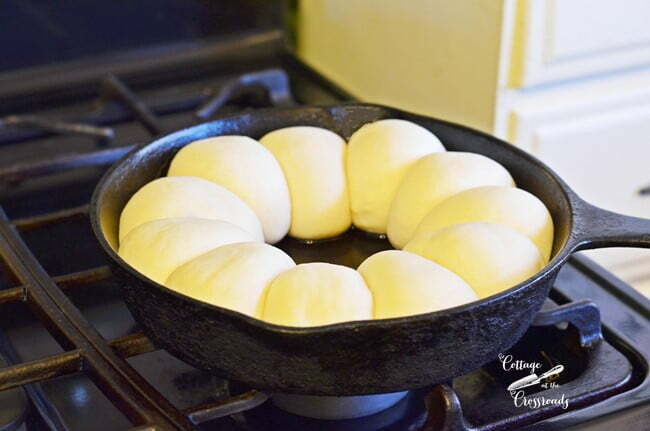 Your addition of those wonderful warm rolls baked in your cast iron skillet is a delicious way to serve it! Pinning! We love appetizers in our house, this looks so good, I can’t wait to try it. Yum! I’ve been wanting to try a bread ring. 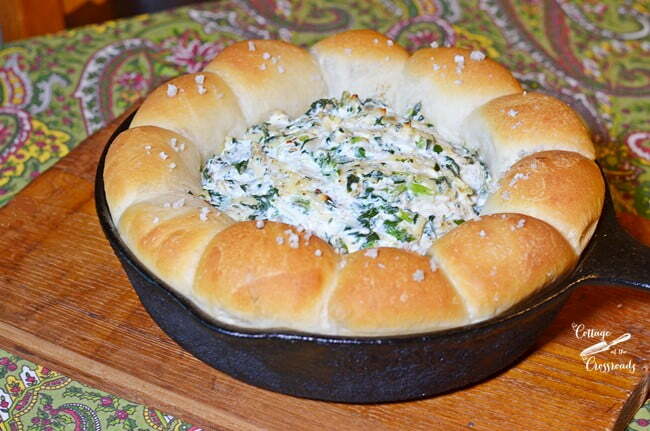 What a great idea to put the bread ring around the dip! Looks delicious! Looks delicious!!! Will try this!! I will definitely be trying this for the New Year. Thanks for sharing. This recipe both looks and sounds so very good. I’m definitely making this for our next party or maybe even for us to enjoy while we watch a movie one night this week. You always have the best recipes, Jane. With bacon and cream cheese, how could it not be amazing?! 🙂 I love the bread ring idea, so clever. This looks so yummy Jane, I love Rhodes rolls. We had them for our Christmas Eve Dinner. I usually have to put my rolls in a warm oven for them to finish rising. I have to try the dip. Anything with cream cheese has to be good. It reminds me of the spinach dip I make. That doesn’t sound good either but it is. Thanks for the shout out. You are too sweet. Tell Leo Hi from me! You had me at bread ring! I love this idea! Would be great for so many dips in the middle! Thanks for sharing! It looks delicious Jane and so pretty too. Im sharing it on my FB page today! Oh my goodness! I never would have thought of using turnips in a dip. But this looks delicious. The roll ring is an added bonus! Thanks for sharing. I can’t wait to try this soon! Such a fun recipe! I absolutely love greens and am always looking for new ways to use them. Can’t wait to try this!